Thank them for giving us the gift of togetherness and safety. Thank them for standing guard in a million different ways to ensure we get to live the greatest life imaginable. Behind every service man and woman in our military is their family. Their greatest cheerleaders, their biggest fans, just waiting and counting down the days for their return. I believe so much of the strength our military has comes from the solid foundation their family provides. The faith and belief in their abilities, their commitment to the very difficult work of leaving home to make someone else’s home that much safer, all of this comes from the family who loves them and supports them. Many of the students I have worked with over the years come from military families. These students have taught me a great deal and have given me such insight to many life lessons. In a military family you have a language all of your own. Here are some of the lessons I’ve learned from the military families in my life. When a member of your family is deployed and far away from you, you learn to cope with the hard days and long nights by counting the sleeps. Only 100 sleeps ‘til daddy comes home. Perhaps the greatest lesson we can learn from our military families is their incredible expression of gratitude. We’ve all seen the videos and pictures of sons, daughters, wives, husbands, and even dogs welcoming home their beloved soldiers. Their gratitude is palpable. You can see how grateful they are as they embrace the gift that is coming home. Every day can be a celebration. Military families don’t often celebrate holidays, birthdays, or anniversaries on the actual day. They have learned to make the ordinary days special, to celebrate loved ones, births, and holidays on any given day. They don’t need a specific date to be thankful or to celebrate. I’m so grateful for all the lessons I’ve learned from the military families in my life. So, as we celebrate this month, check out this great blog with some ideas for how you can show your appreciation to our military families for all they give to us. Military families, we thank you for the lessons you teach us each and every day and for the gifts you have given us, even though you may not have ever known it. If you are currently counting the sleeps, embracing the flexibility of celebrating a holiday early or late, or if you are anxiously awaiting for your soldier to come home, you and your family are in our hearts and our thoughts this month, and always. 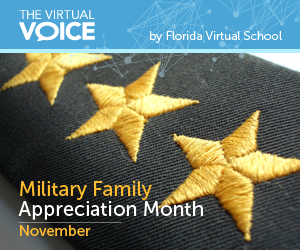 This entry was posted in Educator Edition, Homeschool Edition, Parent Edition, Student Edition and tagged FLVS Community, Inspiration, Military, Military Family Appreciation Month, Service, Thankfulness, Veteran's Day on November 19, 2015 by Guest Blogger.